The Beaver Valley Agricultural Society is the oldest organization in our community. It formed in 1870, as the Collingwood Township Agricultural Society, with those original members breaking off from the Euphrasia Township Agricultural Society which had formed almost a decade earlier. The agricultural societies in Ontario formed with an eye to improving farm stock and crops, with this particular area’s climate being well suited to the production of pasture to feed the various cattle, horses, sheep and swine of those pioneering farmers, plus having excellent grain-producing qualities. “I have long been of the opinion that much benefit would result to farmers by often meeting at this season of the year and comparing their experiences,” wrote William J. Marsh, the society’s first president, in his annual address in 1878. From 1850, when Thornbury was little more than a sawmill, to 1870, when the agricultural society formed, Collingwood Township grew to have 3,576 people on 557 farms with 17,055 acres under crop, according to the census records. This fast became a thriving agricultural community. The agricultural society renamed itself in 1967, becoming the Clarksburg Agricultural Society, in honour of Canada’s centennial year and because the fall fair was held in Clarksburg. 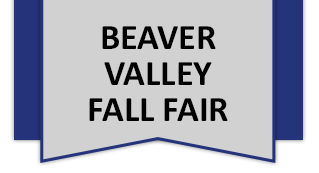 When the fall fair moved in 1972 to the Beaver Valley Community Centre in Thornbury, another name change was in order and it became the Beaver Valley Agricultural Society. The purpose of the annual fall fair hasn’t changed much over the last century and a half. People still show their various homecrafts, baking and preserves, bring their fruits and vegetables, flowers, and hay and grain crops. Animals are still a mainstay, though the huge numbers of cattle, horses, chickens, sheep and pigs that crowded the fairgrounds before the First World War has obviously seen changes. The fall fair is more than just farmers comparing their annual notes on livestock and crop success and failure. In the days before the telephone, never mind the Internet, people had to meet to communicate. Now we choose to meet to celebrate the annual harvest, to educate tourists and residents alike on our farming history and culture, to promote the local agricultural industry and lifestyle, and to celebrate our community’s life and pride by providing the longest-running community event in The Blue Mountains. Long Live The Beaver Valley Fall Fair! Each year, the Beaver Valley Agricultural Society nominates a dedicated volunteer to be the recipient of the Ontario Association of Agricultural Societies Service Award. Below is a list of past winners.